With a bevy of technological changes ruling the present epoch, the insurance industry is in the nub of a major transformation. With insurance companies repeatedly using superseded mix-and-match security solutions, the threat attackers continue to hit them with their most advanced cyber weapons that are available today. This ought to be a major concern and the insurance organizations are on a full swing searching for newfangled ways to revise their data security with an enterprise-level solution that not only convene the most challenging compliance limitations but also brings true security from breach. Nevertheless, the current need for insurance companies is to find the best solution that works with all kinds of data, on multiple operating systems, and in diverse environments, alongside ensuring security. To cater to this demand, there are efficacious cyber security programs that safeguard insurance companies’ vital information from falling into fraudsters’ hands. There are proven, comprehensive set of best-in-class managed security solutions and the latest technology assessment services to protect business-critical and sensitive customer data. In the light of these services, there will be an increased focus on machine learning and data science, ergonomically mitigating attacks. These technologies that are permeating throughout the insurance industry have lead to a competitive advantage in overcoming the cyber attacks. 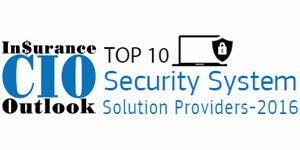 Hence, in the last few months we have looked at a number of security solution providers and shortlisted the ones that are at the forefront of tackling challenges in the industry. 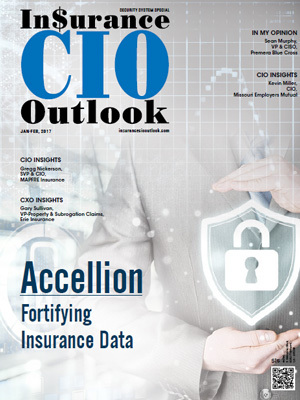 The companies featured in this special edition offers key security solutions to store the customers’ electronic documents, and various apps for securing database that will take the Insurance industry to the next level. 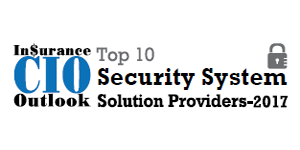 We present to you Insurance CIO Outlook's Top 10 Security Systems Solution Providers 2017.